Before there was television, mass photography, and social media there were postcards. Starting in the early 20th century they became popular forms of communication. Over the next few decades the became primarily associated with tourism as visitors regularly used them to highlight places they had visited. 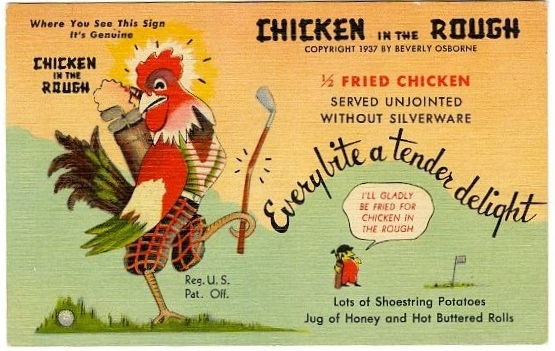 This particular card was an advertisement for the Chicken in the Rough Restaurant which specialized in fried chicken, shoestring potatoes, rolls, and honey. It was located just north of New Market. Though they were cheaply produced and often damaged after being sent long distances, many people collected them because they included pictures and bright images. Today postcards no longer attract the same amount of attention they once did. However, historic postcards give us the ability to learn about communities by highlighting what places people liked to visit and what sites local communities valued and hoped to promote. What would a future historian look at to learn about the way we see ourselves? 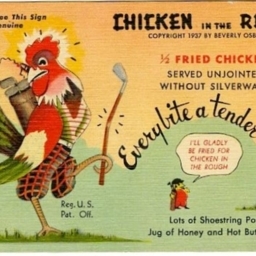 Genuine Curteich, Chicago Ill. , “Chicken in the Rough,” Shenandoah County Library Archives, accessed April 22, 2019, http://archives.countylib.org/items/show/5679.